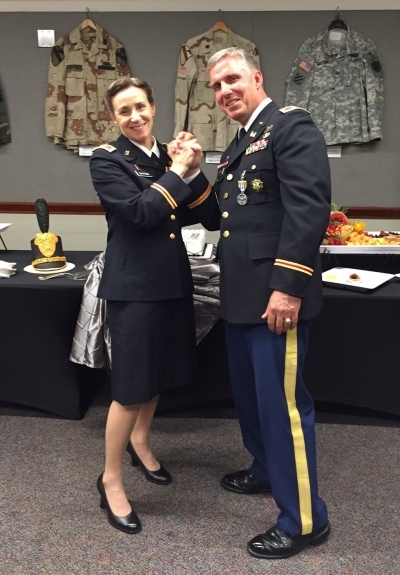 Colonels S. Jamie Gayton (cohort '06) and Elizabeth Krall Gayton (RAND adjunct 2007-2009) retired from the U.S. Army on May 12 at Fort McNair in Washington, D.C.
Jamie graduated with a B.S. from West Point in 1987, an MBA from MIT Sloan in 1996, and a Ph.D. from Pardee RAND Graduate School in 2009. He served 30 years on active duty with combat deployments to Iraq with the 1st Cavalry Division for Desert Shield/Storm in 1990-'91, and the 3rd Infantry Division for Operation Iraqi Freedom in 2005-2006. Jamie also taught economics at West Point from 1996 to 1998 and 2010 to 2013 and served as the Military Assistant to the Army G1 from 2001 to 2003. He was the Deputy Garrison Commander for Transformation in Korea from 2013 to 2015, overseeing $10.7B in construction and synchronizing movements of around 20,000 soldiers, family members, DoD civilians, and contractors from the DMZ and Yongsan to Camp Humphreys. He culminated his military career by teaching economics at the National Defense University’s Eisenhower School from 2015 to 2017 and being promoted to full professor upon departure. Elizabeth graduated with a B.S. from University of California–Santa Barbara in 1986. Her career also spanned 30 years, including 10 years on active duty as an Air Defense Officer at Fort Bliss, Texas; Ansbach, Germany; and Fort Lewis, Washington. She spent 18 years in the New York Army National Guard and also provided local support in Georgia and Kansas. While Jamie was at Pardee RAND, Elizabeth also worked as an adjunct at RAND in Santa Monica. Later, in New York, she played a leading role in the response first to Hurricane Irene in 2011 and then to Hurricane Sandy, the storm that devastated New York and New Jersey, in 2012. She spent her final two years in the U.S. Army Reserves in Korea. Elizabeth had received her retirement announcement in the mail while in Korea, so as a surprise, Jamie collected her orders and requested her retirement certificates from the retirement processing center in New Jersey. When Jamie’s ceremony started, Elizabeth was called to the stage as a “spouse” and then the presiding officer, MG John Ferrari, one of Jamie's West Point classmates, proceeded to recount Elizabeth’s entire career and retire her before retiring Jamie. Jamie noted that several of Elizabeth’s friends flew from across the United States to witness her retirement. "There was even a decoy program in the VIP ready-room, with only my information, to maintain the surprise. The complete program was in the auditorium for all others to see," he said proudly. The Gayton family will remain in Northern Virginia. Jamie will work in the private sector in the finance field, starting his new job in late August.